It’s the time of year when resolutions are being tossed around by folks as if they are a discus team warming up for the Olympics. While many rush to sign up for gym memberships, other resolutions include spending more time together with loved ones or learning to cook more. 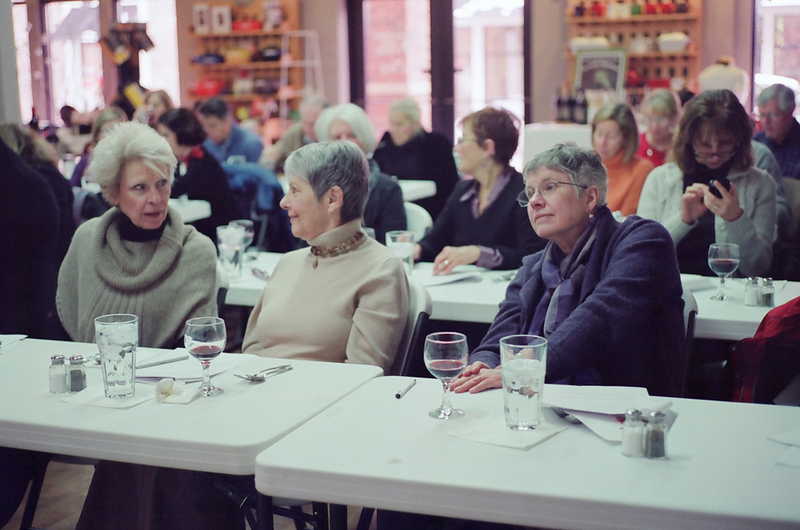 These upcoming classes and events at Cooking at the Cottage offer a chance to do just that. Friday, January 11th ● 6:30 – 8:30 pm ● “Date Night” ● Hands On Class ● David Moeller – Sullivan University ● $105.00 for TWO individuals Menu: Smoked Pork “Bahn Mi”, Pickled Vegetables and Spicy Soy Glaze ● Sautéed Chicken with Forestier Sauce, Whipped Potatoes and Roasted Vegetables ● Bananas Foster with Ice Cream and Biscotti *Remember when registering ~ 2 individuals = 1 table, so please use the number(s) of tables you desire when making your reservation. Aprons are not provided. Saturday, January 12th ● 6:30 – 8:30 pm ● “Date Night” ● Hands On Class ● Mike Cunha – Sullivan University ● $105.00 for TWO individuals Menu: Shrimp and Grits with Red Eye Gravy ● Beef Tenderloin with Sauce Diane, Oven Roasted Potatoes and Vegetable ● Chocolate Espresso Mousse with Chocolate Cream *Remember when registering ~ 2 individuals = 1 table, so please use the number(s) of tables you desire when making your reservation. Aprons are not provided. Friday, January 18th ● 6:30 – 8:30 pm ● “Date Night” ● Hands On Class ● David Moeller – Sullivan University ● $105.00 for TWO individuals Menu: Lump Crab Cakes with Spicy Rouille ● Beef Tenderloin with Bleu Cheese, Wild Mushroom Butter, Stone Ground Grits and Wilted Greens ● Lemon Mascarpone Tarts with Macerated Berries *Remember when registering ~ 2 individuals = 1 table, so please use the number(s) of tables you desire when making your reservation. Aprons are not provided. Saturday, January 19th ● 6:30 – 8:30 pm ● “Date Night” ● Hands On Class ● Mike Cunha – Sullivan University ● $105.00 for TWO individuals Menu: Manhattan Seafood Chowder with Garlic Croutons ● Seared Breast of Chicken with Sauce Picatta, Brown Rice and Vegetable Medley ● Vanilla Bean Crème Brulee with Toasted Marshmallow *Remember when registering ~ 2 individuals = 1 table, so please use the number(s) of tables you desire when making your reservation. Aprons are not provided. Friday, January 25th ● 6:30 – 8:30 pm ● “Date Night” ● Hands On Class ● David Moeller – Sullivan University ● $105.00 for TWO individuals Menu: Country Ham, Asiago and Wild Mushroom Macaroni and Cheese ● Horseradish Dijon Crusted Pork Loin Chops in a Brandy Cream Sauce with Farro Pilaf and Sautéed Vegetables ● Chocolate Pistachio Mousse *Remember when registering ~ 2 individuals = 1 table, so please use the number(s) of tables you desire when making your reservation. Aprons are not provided. Saturday, January 26th ● 6:30 – 8:30 pm ● “Date Night” ● Hands On Class ● Mike Cunha – Sullivan University ● $105.00 for TWO individuals Menu: Smoked Chicken Pot Pie with Flaky Pastry Crust ● Boneless Pork Chop with Apple Cranberry Veloute, Cheese Grits and Broccoli and Carrots ● Double Chocolate Bread Pudding with Sweet Cream *Remember when registering ~ 2 individuals = 1 table, so please use the number(s) of tables you desire when making your reservation. Aprons are not provided.